Sides of Wisconsin Meadows 100% grass-fed beef, cryovac sealed, frozen and delivered to your door! Stock up for winter – plenty of beef for soups, stews and pot roasts to take the chill away! 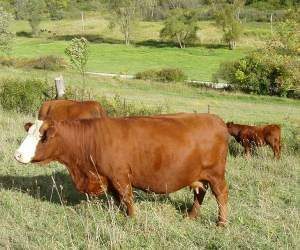 The Wisconsin Grass-fed Beef Co-op sells wholesale product, direct to consumers, in half or whole animals by hanging weight. Hanging weight, also called “Hot Carcass” weight is the actual weight of the animal shortly after it is slaughtered, minus skin, head, and most internal organs. Processing and delivery charges are included in the total WGBC price/lb. Some producers advertise a cheap hanging weight price, which can make your purchase sound like a real bargain, though most people are used to seeing the weight of the meat after it is processed. Make sure you understand what you’re ordering. Ask what kind of yield you can expect from the hanging weight; in other words, how much meat you’ll be putting in your freezer. It should be approximately 60-75 percent of the hanging weight depending on the cutting instructions you choose and the items you accept or decline. – 400 – 475 lbs of finished, table ready meat. The actual finished weight you receive will depend on the cutting instructions you choose. If you have everything deboned, and decline your soup/dog bones, organs, etc your yield will be closer to 60% of hanging carcass weight. If you take everything you have coming, and include bone in all your cuts, your yield could be as high as 80% of hanging carcass weight. Regardless of cutting instructions, there will also always be a “Shrink” or water weight loss, as the carcass hangs and loses moisture. The size of your carcass may vary but the yield percentages will usually remain in the 60-75 % range. Pricing: Pricing for a whole steer is $4.29 per lb hanging weight, yielding an approximate $6/lb finished weight price. Unlike many farm direct programs, all costs of processing, packaging and delivery to your home are included in our price. Please fill in the info below, if unsure about something, leave blank – we will call you to walk you through your options and confirm your order and payment of deposit. Please note: our direct sales & delivery is only available in Wisconsin. Live in a nearby state or passing through? Contact us for pick up options. Select...... 1 LB. 2 LB. 3 LB.